Bryndefaid Stud. Welsh Mountain Ponies. We are a small stud based in the north of Scotland aiming to breed a type of pony which is able to compete in all ridden disciplines but retains the scope, quality and size of the true Mountain Pony. 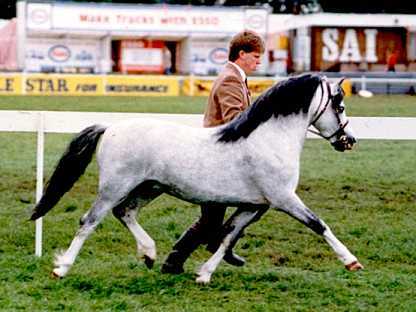 The Stud was formed in 1981 following a decision to breed from	our first pony Madog Dolly. 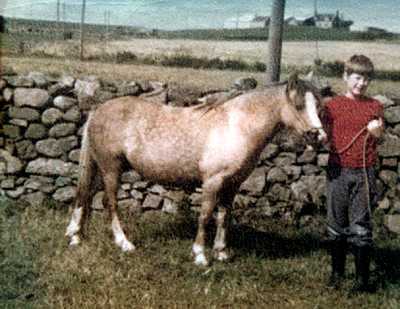 We had both learnt to ride on Dolly	and decided we would like to breed mountain ponies once we	had outgrown her. Unable to find a Stallion in the area we saw an	advert for Waxwing Herald, a yearling colt who had won at the	Great Yorkshire. One look at Herald and Kathleen's mind was made	up. The Stud was born. The Prefix was not registered until a couple of years later on the	birth of our first foal, and it was not until many years later that we	realised that this literal translation of the farm name also meant	"Hill Sheep" - but by then it was too late to change it ! Herald was the oldest of the 4 full brothers by Cantref Glory out of Revel Hetty, the others being Waxwing Herod (Imperial stud - Australia), who qualified for HOYS as a yearling before being exported, Waxwing Hurricane (retained at Waxwing), who won the Royal Welsh as a yearling and Waxwing Hill-Billy who was	exported to Holland. The Stud owes everything to Herald with all of our female lines tracing back through	his daughters. He was not a prolific breeder and only left five fillies in his life time, four of which are retained all out of different Foundation mares, and they now form the basis of the stud. Apart from Morwenna who has been with us since a foal and is by our own Friars Sprightly, sadly the others	have all passed away and we would like to thank each of them for there part in the story and the future. Visitors are always very welcome but please contact first.